Breaking ground at Fall Creek Falls State Park are, from left, are Keith Pyle of Bell Construction; Bledsoe County Mayor Gregg Ridley; Lt. Gov. Randy McNally; Rep. Cameron Sexton; TDEC Deputy Commissioner Brock Hill; Deputy Gov. Jim Henry; Ann McGuaran, state architect; Rep. Kelly Keisling; Rep. Ron Travis; General Services Deputy Commissioner John Hull; Ron Lustig of Earl Swensson Associates; and Park Manager Jacob Young of Fall Creek Falls State Park. 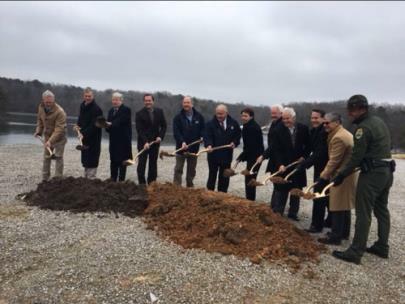 Tennessee State Parks and elected officials broke ground on Tuesday for a new inn, restaurant and conference center at Fall Creek Falls State Park, part of a broader $200 million investment in state parks over the last eight years by Governor Bill Haslam’s administration and the Tennessee General Assembly. The facility at Fall Creek Falls is part of over $175 million in capital projects appropriated for state parks since 2011. Tennessee’s state parks received more than 38 million visits in 2018, the highest recorded visitation ever. Tennessee State Parks have strategically, and selectively, added nearly 40,000 acres to state park and natural area holdings under the Haslam administration. The additions in the last eight years include three unique state parks – Cummins Falls State Park in Jackson County; Lamar Alexander Rocky Fork State Park in Unicoi County; and Seven Islands State Birding Park in Knox County, bringing the current total of state parks to 56. The state now manages or oversees more than 225,000 acres in Tennessee, one of the largest state park public land portfolios in the eastern United States. · New pedestrian bridges at Cumberland Mountain State Park, Chickasaw State Park and Seven Islands State Birding Park. Fall Creek Falls State Park has seen the renovation of 20 cabins and the refurbishment of an additional 10; renovation of Village Green buildings; installation of a new irrigation system at the golf course; renovation of the swimming pool and snack bar area; new playground area; roof replacements; restroom upgrades; and fresh paint. At Fall Creek Falls, the new inn and restaurant are forecast to generate $278,000 per year in sales and occupancy taxes, a growth of $90,000 per year compared to revenue from the previous facility. Short-term, construction is expected to bring in an estimated $14.7 million in taxable spending to the area, along with more than 100 construction jobs. The 98,000-square-foot facility is designed to reflect the natural setting of the park and will include three floors of visitor space with double rooms, king rooms and suites at the inn; indoor and outdoor gathering areas with larger meeting rooms for conferences; and paths connecting the facility to recreational trails at the park. The restaurant faces Fall Creek Lake, providing scenic views for diners. The facilities at Fall Creek Falls are part of a robust number of state parks in the Upper Cumberland region, including Burgess Falls State Park; Cumberland Mountain State Park; Justin P. Wilson Cumberland Trail State Scenic Trail State Park; Rock Island State Park; Sgt. Alvin C. York State Park; Standing Stone State Park; Cummins Falls State Park; Cordell Hull Birthplace State Park; Edgar Evins State Park; and Pickett CCC Memorial State Park.